Eighty years later, half way around the world in a village in the northern Kashmir region of India, a man quietly climbs the stairs leading to the upper room of his family’s ancestral home. He has dedicated this time each morning, for over a decade, to meditation while the rest of his family sleeps. Aside from a more disciplined life and increased self-control, he has noticed only minor changes to his personality after years of steady practice. This morning, however, all that will change, and he will be irreversibly thrust into a startling new world of inner experience. My mind, deeply under the influence of the ideas, images, and emotions called up by the reading and talk, was calm and peaceful. I was in a state of quiet, almost passive enjoyment, not actually thinking, but letting ideas, images, and emotions flow of themselves, as it were, through my mind. All at once, without warning of any kind, I found myself wrapped in a flame-colored cloud. For an instant I thought of fire, an immense conflagration somewhere close by in that great city; the next, I knew that the fire was within myself. Directly afterward there came upon me a sense of exultation, of immense joyousness accompanied or immediately followed by an intellectual illumination impossible to describe. Among other things, I did not merely come to believe, but I saw that the universe is not composed of dead matter, but is, on the contrary, a living Presence; I became conscious in myself of eternal life. It was not a conviction that I would have eternal life, but a consciousness that I possessed eternal life then; I saw that all men are immortal; that the cosmic order is such that without any peradventure all things work together for the good of each and all; that the foundation principle of the world, of all the worlds, is what we call love, and that the happiness of each and all is in the long run absolutely certain. Years earlier, Bucke had become intrigued by the life and writings of the famous American author Walt Whitman. After reading Whitman’s book, “Leaves of Grass,” Bucke began searching for a deeper meaning behind the dense allegories contained in his poetry. To Bucke, Walt Whitman represented a new type of man – a step forward in evolution. Bucke theorized that man’s consciousness was evolving through a slow process of biological evolution based primarily in the central nervous system. It would be one generation later on the other side of the world in India, when another man, Gopi Krishna, would unwittingly unlock the secrets to Bucke’s theory. 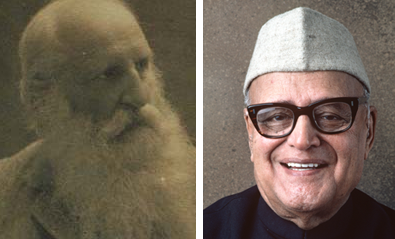 Gopi Krishna was born in 1904, one year after Bucke’s death, in the northern province of Kashmir. By the time he was in his thirties, Gopi dedicated his early morning hours to a practice of meditation he developed since the age of 17. This morning began like any other morning, but what would unfold would be a process of transformation that would continue until Gopi’s death in 1984. Suddenly, with a roar like that of a waterfall, I felt a stream of liquid light entering my brain through the spinal cord. Entirely unprepared for such a development, I was completely taken by surprise; but regaining my self-control, keeping my mind on the point of concentration. The illumination grew brighter and brighter, the roaring louder, I experienced a rocking sensation and then felt myself slipping out of my body, entirely enveloped in a halo of light. It is impossible to describe the experience accurately. I felt the point of consciousness that was myself growing wider surrounded by waves of light. It grew wider and wider, spreading outward while the body, normally the immediate object of its perception, appeared to have receded into the distance until I became entirely unconscious of it. I was now all consciousness without any outline, without any idea of corporeal appendage, without any feeling or sensation coming from the senses, immersed in a sea of light simultaneously conscious and aware at every point, spread out, as it were, in all directions without any barrier or material obstruction. I was no longer myself, or to be more accurate, no longer as I knew myself to be, a small point of awareness confined to a body, but instead was a vast circle of consciousness in which the body was but a point, bathed in light and in a state of exultation and happiness impossible to describe. We talked leisurely, discussing our work, when suddenly while crossing the Tawi Bridge I felt a mood of deep absorption settling upon me until I almost lost touch with my surroundings. I no longer heard the voice of my companion; she seemed to have receded into the distance though walking by my side. Near me, in a blaze of brilliant light, I suddenly felt what seemed to be a mighty conscious presence spring from nowhere encompassing me and overshadowing all the objects around, from which two lines of a beautiful verse in Kashmiri poured out to float before my vision, like luminous writing in the air, disappearing and suddenly as they had come. Without any effort on my part and while seated comfortably on a chair, I had gradually passed off, without becoming aware of it, into a condition of exaltation and self-expansion similar to that which I had experienced on the very first occasion, in December 1937 […] The marvelous aspect of the condition, lay in the sudden realization that although linked to the body and surroundings I had expanded in an indescribable manner into a titanic personality, conscious from within of an immediate and direct contact with an intensely conscious universe, a wonderful immanence all around me. My body, the chair I was sitting on, the table in front of me, the room enclosed by walls, the lawn outside and the space beyond including earth and sky appeared to be most amazingly mere phantoms in this real, inter-penetrating and all-pervasive ocean of existence which to explain the most incredible part of it as best I can, seemed to be simultaneously unbounded stretching out immeasurably in all directions, and yet no bigger than an infinitely small point. […] It was an amazing and staggering experience for which I can cite no parallel and no simile, an experience beyond all and everything belonging to this world, conceivable by the mind or perceptible to the senses. From this point until the end of his life, Gopi Krishna possessed a new form of consciousness which would serve as a constant source of beauty, happiness, and insight. His transformation continued unabated. He continued to witness an intelligent energy at work in his body and mind, and began his own investigation into the phenomenon. There had to be some explanation for the years of transformation and his resulting consciousness. His findings would later form the basis of a whole new area of scientific research. Richard Bucke and Gopi Krishna. Two pioneers in the frontier of consciousness research. Years later, while in his 70’s, Gopi began writing prolifically, marking a new phase in his development. Books of rhyming poetry poured out from him – the words seemed to emanate from the consciousness that was now a part of his everyday experience, crystalizing to form whole words and sentences. He also began writing about his transformative experience and the resulting consciousness in him. The resulting consciousness was the result of a biological mechanism in the body, usually operating only at very low levels. This mechanism, once activated, would accelerate the process of evolution toward a pre-determined target. Since human evolution is predetermined with cosmic consciousness as its goal, it is through our own choices that we can either act in concert with, or oppose the natural evolutionary life processes leading to higher consciousness. According to Gopi’s writings, the existence of the nuclear weapon should, to a healthy mind, indicate a blighted and sickly condition of human consciousness. Understanding the operation of the evolutionary mechanism at work in all of us was, to him, the secret key to improving civilization. The persuasiveness of his writings eventually found its way to Canada and the United States, influencing a group of young and motivated people to assist Gopi with his research. The group in Canada was from approximately the same region in which Bucke had lived almost a century prior. Just as the Canadians were drawn to Gopi Krishna, Bucke had found a friend and teacher in a man with a radical new style of writing. However, Bucke went so far as to accept Walt Whitman almost as a guru in the classical Indian sense. Bucke strived to imitate the style and even dress of Whitman, just as an Indian spiritual seeker imitates the style of his guru. 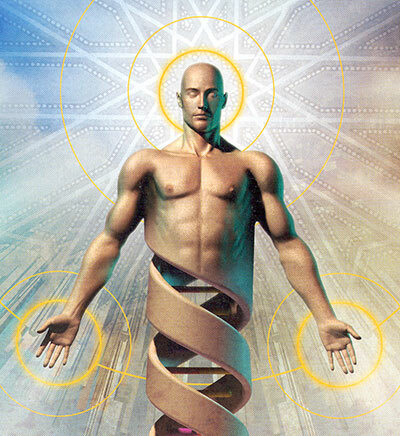 From his own experience of spiritual awakening, and from the time spent with his teacher, Bucke began forming a new theory of evolution, which would be published in a book toward the end of his life, titled “Cosmic Consciousness.” In it, he presents his theory that man’s evolution is toward a higher dimension of consciousness. The future human race would be characterized by a greatly amplified intelligence and moral sense. Individuals like Jesus and Buddha, rather than being deities themselves, to Bucke represented members of the next phase of human evolution. But it was Gopi Krishna who hypothesized that this mechanism was a biological mechanism which could be verified and studied using the methods of science. 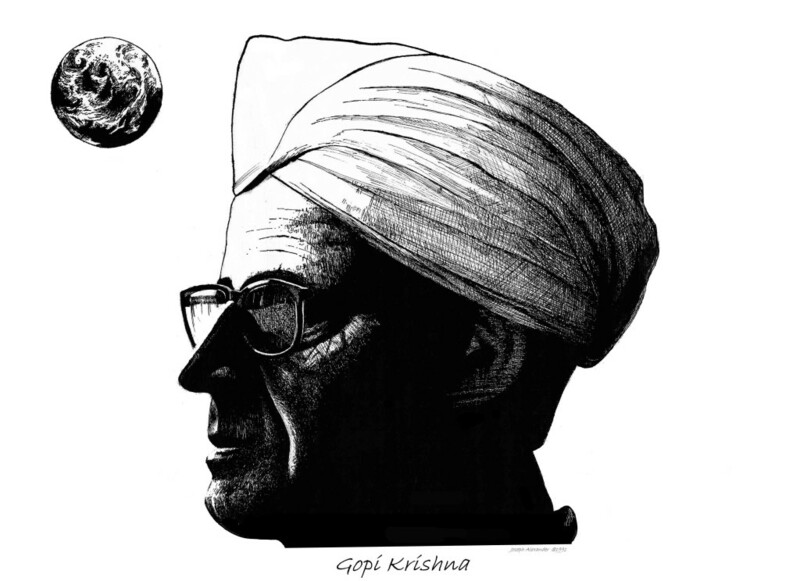 During the course of Gopi Krishna’s life, he would watch the world undergo many radical transformations, perhaps more so than any other time in history. World War I, World War II, and the conflict between the Western and Eastern blocs resulted in a divided world. His first book, “The Shape of Events to Come” held a simple but powerful message: just as a disregard for the laws of the body result in physical illness, our violation of the hidden laws of mind had, over the course of time, resulted in a world threatened by the looming specter of global nuclear war. During mankind’s pursuit of scientific and technological process, leading minds had disregarded the very thing that produces all of these advancements – the human spirit and the mind though which it expresses itself. In haste, science had simply claimed ignorance in its ability to solve the problems for which religion is supposed to provide answers. By disregarding these important fundamental questions of the mind and spirit, we are left in a dire conundrum. On one hand we have grown highly sophisticated and intelligent, and on the other completely ignorant of how to apply this intelligence for the betterment of humanity and the planet. Nuclear weapons are a symptom of something much deeper than a historical aggressiveness, implying a deterioration of morality and humanity’s desire for life itself. Gopi worked with researchers and scientists around the globe, including the immanent Dr. Friedrich von Wiezacker of Germany, to create a hypothesis and a series of proposed experiments to prove that evolution was a much more profound and intricate a process than the oversimplified theory of Darwinian evolution supposed. If it could be proven that our evolution was guided by a mechanism with a pre-determined goal, it would imply that a greater intelligent force operates behind the scenes to shape human life on Earth, requiring our obedience to its laws. According to the hypothesis, it was not in this century or even in the last few hundred years, but thousands of years ago that the mechanism behind our evolution was independently verified by multiple ancient cultures around the world. It was so precisely identified that it was given the name “Kundalini” in India, meaning “the coil of life originating from the lowest center” implying a link to the organs of the reproductive system. In fact, the energy of this evolutionary mechanism is linked to the procreative forces of life. Gopi Krishna. Artwork by Joseph Alexander (ink and paper). Day in and day out during Gopi Krishna’s transformative experience he witnessed the operation of a living, intelligent energy within his body. As he began to investigate the phenomenon further, he encountered many people who had experienced similar symptoms. It seemed as though the same mechanism that was at work within him was also responsible for varied forms of spiritual experience. Indeed, based on his observations, this mechanism was in all likelihood the architect of the mind itself, as it seemed to be responsible for maintaining normal human consciousness, as well as genius, insanity, and spiritual experiences. The rest of his life was spent researching the subject, writing books, and urging scientists and researchers to study Kundalini in more detail. After 30 years since his death, Kundalini research is now more important than ever. The primary importance of the research lies in what can be learned about the needs of the evolving human brain, and what can (and does) go wrong when we live our lives in ignorance of its inner workings. The more this process of transformation is at work within an individual, the more time, energy, and resources must be devoted to maintaining a healthy balance in life. As we look around at our existing political and economic establishments, we see a system in which the spiritual side of man has no place. And yet in an intelligently ordered world these systems would serve to bring about a harmonious existence to the people of the Earth. The reason this has not yet occurred is because we do not yet have a complete view of the human mind. It would be impossible to explore our solar system if we were still under the illusion that the Earth was flat. Likewise, it is only through the research of this new scientific and spiritual frontier that we can equip ourselves with the knowledge necessary to live our lives in a way that will bring about the fulfillment of our evolutionary destiny. Like Copernicus and Galileo before them, it may take time before the discoveries of Richard Maurice Bucke and Gopi Krishna are confirmed by science. The urgency for this research has never been greater, and there has never been a better time than now to share this knowledge with the world. Profound, deep and soulful article on Kundalini, sincere gratitude and thanks for sharing! My First few meetings with Gopi Krishna sometime during 74-1983, as if were preordained because my Life has never been least usual since way back then. A Team of Canadian Researchers including Dr Paul Pond and Dr.Micheal Bradford, Chuck were in India during those years and it was nearly then ” The Shape of Events to come ” and ” The Riddle of Consciousness were published. Although I been a part of Library Research Team Started by a small Team of few of us then ” The World Anthology of Expanded Consciousness Experience ” but the work never stopped and have continued to amaze me even decades later. Each and every major event of my own life including most all psychological, pathological and physiological changes noticed by me in my own system during past forty years certainly confirm to the Hypothesis and all other conditions elaborated by Gopi Krishna in all His works. Till this day. A few of us in Association with Universities here in India stand prepared and are nearly ready today to take up a few components for empirical verification and might as well push several mini Projects based on the Proposal outlined by Gopi Krishna in Bio Basis….” to further the Work on Kundalini Research which Gopi Krishna ji started during his Life time and is being carried through in Canada, US, India and at some other places ! I am really, deeply urging to know more and profoundly about Kundalini. Do you know any one who can help me to learn Kundalini yoga, not organised mony – minded people but a genuine seeker. Are there siddhas in the himalayas these days or that all has become a myth? Spirtual quest is guided by inner light. Appreciate your interest in Kundalini Yoga. Yes ! As you have allured, indeed there are Genuine as well as charlatans and it would save much time, efforts and precious energies to Learn Kundalini Yoga only from one who be having deep insights as well as personal experience. In Himalayas we do have very many ardent seekers and also a few hermits sages but just a very few those who do not wish name fame or money to teach . Our present day world owes deep Gratitudes to Pandit Gopi Krishna ji for his nearly 4 decades of continued writings and such exhaustive content to explain the Secrets of Kundalini as well elaborate mechanism and methodology to awaken this esoteric divine power in us.But to comprehend in toto that wouldrequire a deeper study and focus. If there be any specific area you are very welcome to write me at following mail id just please mention in the subject line ‘ Kundalini ” and I shall try my best to reply on your query soon as be possible with whatever best possible ! Warm Regards to you Sir ! Thank you very much for a very enlightening commentary on Kundalini. I find reader comments equally instructive in pursuing one’s full potential which kind of seems unlimited. What I have understood after reading Gopikrishna is that all forms of Yoga,which invariably includes the prerequsites of Yama , Niyama,asana ,pranayama, pratyahara,dharana (Iam leaving out Samadhi which is the culmination) will invariably lead to the ascent of kundalini , but again there is a catch to it. The individual has to hav e the pre requsites of morality, compassion , love and moderation in every thing. Awakening of kundalini can happen even in bhakti yoga or even in a jnana yogi . Ultimately the cosmic energy coiled in the muladhara of the individual has to awaken .A self less concecrated life will make it easier rather than any self centered desire to achieve. But since we havent experienced it convincingly but surely many of us have intimations of it,let us silently do our sadhana and let the cosmic energy or intelligence work inus the way it wants. I accidentally awakened my kundalini in 1973. I did not fit any cryterior for awakening other than a very dilligent practice of pursuing and exploring the energy and light I found when I silenced my mind. I do recommend deep inner reflection and the release of emotional reactions to life in the present. Awakening without preparation should be avoided but if spirit wants you to awaken you will prepared or not. Deeply touched and delighted by the expressions and information, as provided by Michael Molina and all of the foregoing comments. Destiny took me to the book-kiosk that existed in 1978 at the Rajghat, in Delhi. The reading of ‘My Experiments With Truth’ of Mahatama was fresh in my mind and perhaps had drawn me to Rajghat. The two books I purchased from there were Pranayam, a Rs2.50p paper-back and Kundalini by Pt Gopi Krishan. Suffice to say that while both of these books overwhelmed me I successfully overcame them and went through the roller-coaster of my life. Spoke about these ‘sciences’ to the then Soviets in their country and a whole lot more to the Yankees while living in the US. Ashok Sharma Sahab, I have been blessed to enjoy repeated ‘connections and that I am lucky to have those biological basis that much more aligned…so it occurs to me. 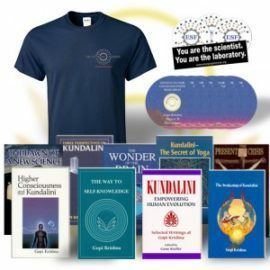 I would like to associate more in the process of bringing Kundalini in the realm of Science….